The Relay Marathon consists of running the 42.195km of the classic marathon alongside marathon runners…but in a team, by dividing up the distances! Each team must be made up of 3 runners who will cover the different sections of the route on offer: the first one will run around 20,5 km, the second 14,5 km and the third one 7 km. A great opportunity to share the effort and the joys of competing with friends and/or family, whatever your level. The team designates its leader, who registers on the time to platform. The leader fills in the team name and chooses a password which he passes on to his two team mates. The team mates register in turn on the platform. N.B. : the runner covering the 21km must indicate a target time when he registers to be placed in the right starting area on Race Day! Advantage for the first entrants: the registration fee is €90 for the first 100 teams, then €99 for the following ones. During the relay points, the route will be divided between the relay runners (on the right) and the marathon runners (on the left). Volunteers will also be present to remind relay runners to remain on the part of the route which is reserved for them. Each of the 3 relay runners must wear their own number on their chest tied with 4 pins. Each of the 3 relay runners must pick up his own bib on the Village: it will allow him to be identifiable to access SAS departure and relay areas. The first runner (the one who will run 20.5 km) recovers, in addition to his personal bib, the bib of the team with a chronometer chip on the back. This will be provided with a bib belt. In order for the team to be classified at the finish, it is imperative that each relay runner run with his bib chipped. We advise you to hang it on the bib and pass it at each relay, as a witness. The first relay runner will set off from Quai Tilsitt, at the same time as the marathon runners and half-marathon runners. The 2nd and 3rd relay runners will wait in their reserved areas. Each time a runner arrives, his number will be announced by a volunteer through a speaker, so that his team mate gets ready to take over! At the end of each relay, the runner receives his medal as well as refreshments in his relay zone. 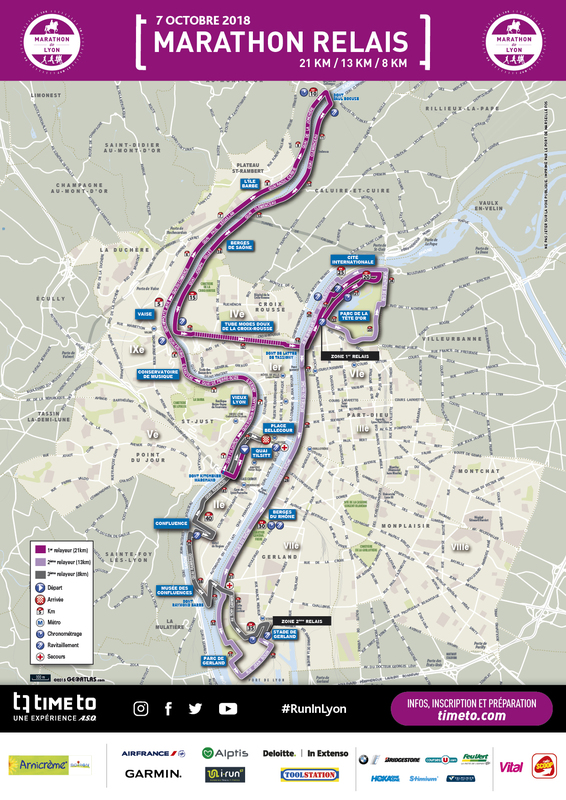 He will then take the subway to go to the centre of Lyon and welcome the last relay runners in style! How can I go to the relay zones? Each runner makes his own way to and from the race. Good news: the two relay zones are near the subway stations (tram T1 Condorcet for the 1st relay zone, Stade de Gerland for the 2nd relay zone). Don’t forget that from an environmental point of view, public transport is THE way to travel! What can I do with my belongings during the race? Only one left luggage facility will be available. It will be located on Place Bellecour. Two options are on offer to the 1st and 2nd relay runners who don’t want to be weighed down with their belongings: they can give their bag to each other (the 1st relay runner gives his bag to the 2nd relay runner, and the 2nd one to the 3rd ), or they can leave their bag at Place Bellecour, but that implies coming to collect it …a great opportunity to welcome the last relay runner! As for the 3rd relay runner, he can drop off his bag at the left-luggage facility in Place Bellecour and collect it at the finish.